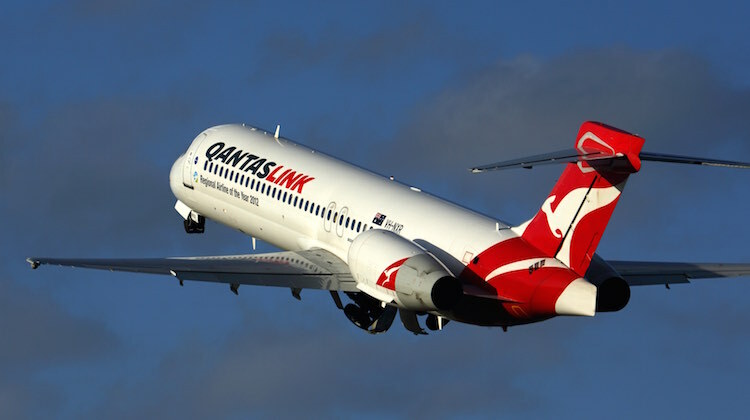 QantasLink is establishing a new heavy maintenance base in Canberra that will be responsible for the airline’s fleet of 18 Boeing 717s. The facility will open in October and create about 40 skilled engineering roles, QantasLink said in a statement on Friday. Currently, QantasLink conducts line maintenance on its 717s at Canberra Airport. “Canberra will be at the heart of our Boeing 717 engineering operations, which will complement our increased flying out of Canberra with this aircraft type and allow us to better utilise our existing assets at Canberra Airport,” QantasLink chief executive John Gissing said. Canberra will be QantasLink’s second heavy maintenance facility. Currently, QantasLink’s fleet of Q400, Q300 and Q200 turboprops undergo their regular heavy maintenance checks at Tamworth in Northern NSW. Previously, Qantas sent its 717 to Cobham Aviation Services’ engineering facility in Adelaide for heavy maintenance checks, which occur every two years, usually take about 28 days and require about 5,500 man hours. The return of heavy maintenance work in-house comes after a period where Qantas had progressively shuttered its engineering facilities at Sydney, Melbourne Tullamarine and Avalon, resulting in hundreds of job losses. ACT Chief Minister Andrew Barr said the agreement between the government and QantasLink to bring its 717 fleet to Canberra for heavy maintenance was for five years and allowed for further expansion. “I am aware that QantasLink had a number of cities to choose from, but we put a strong case to them to bring this investment to Canberra,” Barr said in a statement. The work will be undertaken in QantasLink’s existing hangar at Canberra Airport, which was originally built with ACT government support for Impulse Airlines to maintain the short-lived low-cost carrier’s Boeing 717s there. Qantas acquired Impulse Airlines in 2001, inheriting the hangar before it was completed, as well as Impulse’s fleet of 717s. The hangar was designed to accomodate three 717s (or two 737s or a single 767). Jobs gained in Canberra but presume jobs lost in Cobham Adelaide? Net change Australia wide zero. QantasLink 717’s all seem to be leased from various banks and Boeing and all operated by Cobham. Makes me wonder who really controls maintenance? Presumably Qantas have their legal entity on something somewhere or they would not be able to make this change? Pretty sad seeing the photos of the ex Mexicana 717’s minus engines in storage and now smart with QantasLink business class interiors. Back to the future for Canberra. Didn’t Impulse do their maintenance on the B717s in Canberra? This article is incorrect. Qantaslink do not carry out line maintenance on the 717s in Canberra. It is Cobham Aviation services that currently provide this role. Qantaslink are taking over this role from July. They have failed to mention how may jobs will be lost in Adelaide and the additional 14 job loses from Cobham Aviation services Canberra Line maintenance. The supposed 40 skilled jobs set to be created are planned to be through contract hire companies and not full time positions with Qantaslink. Like you say Tony, net change to jobs in Australia is Zero, just poorer working conditions and pay for the skilled workforce. I find it a little sad that whilst Qantas is busy patting itself on the back on the creation of 40 jobs in CBR, no one has really acknowledged the fact that it was Cobham who put all the hard work into setting up B717 operations in CBR. This along with modifying the aircraft with business class in its maintenance facility in Adelaide prior entering service & maintaining the remaining 13 (all economy) B717s that have been in service with Cobham after the aircraft were used to start up Jetstar prior to Jetstar obtaining it’s current domestic fleet of A320 aircraft. It might have been appropriate for Qantas to acknowledge Cobham for the work they have done thus far with the B717 programme. Also there has been little or none mention of the 14 Cobham engineers in CBR that have been made redundant, or the 26 Cobham heavy maintenance engineers that have now lost their jobs. It would appear that Qantas has used Cobham to do all the hard work in CBR & now that it’s up running they have taken this work back off Cobham 18 months into a 5 year contract that they had with Cobham. This move seems to be a rather ruthless Qantas management decision especially as it appears to have taken Cobham completely by surprise. If that’s true Snork (and I’m not saying anything either way) it will put a significant strain on the working relationship that QF has in the west with Cobham since those 717’s are a significant part of the intrastate fleet in WA. Or does this forshadow QF killing off that contract too and sending the 717’s east, replaced by Network’s F100’s? These seems like a rather underhanded move by Qantas. They award the contract for East Coast 717 operations to Cobham. Let them modify the aircraft to include business class plus wifi….. Something QF could never have managed themselves without major delays. Wait for cobham to get the operation running smooth then step in and take it all away! I expect they’ll take their BNE operations away shortly too! And how can QantasLink possibly hope to do 717 heavy maintenance cheaper in CBR than Cobham in ADL? A company with a proven 10 year track record of excellent safety and dispatch reliability vs a new operation in an area that has always been notoriously hard to employ good people. Again, underhanded move Qantas…. I’m sure your customer relations are very important but think about those you do business with….. Not just those who sit in your cabins! Unfortunate for those cobham engineers in Adelaide. They kept those aircraft running well for so many years despite the ever present pressure of Qantas and them being somewhat neglected by previous operators. On the whole there will once again be fewer engineers employed across Australia as Qantas moves to a smaller and less skilled workforce. Ben – it is possible this is the thin edge of the wedge between QantasLink & Cobham in the west & F100 aircraft would easily fill the role of a B717 but what you might find unusual is that Qantaslink has withdrawn it 2 x Q400 aircraft from Perth & sent these aircraft to Cairns in a effort to rationalise the QantasLink Q400 / Dash 8 Fleet. It will be interesting to see what Qantas / QantasLink do in the west in the future? But at the moment QantasLink have no way of taking over the Cobham B717 operation in WA. Network F100’s might be a easy / cheap option. I doubt Qantas would take on B717s in the mainline operation as they already regard mainline LAMEs as overpaid & thus more expensive than the Cobham outsourced alternative. I also feel for the all the Cobham staff effected by the QantasLink announcement (as I’m one of the 14 in CBR) more so for the dedicated & loyal heavy maintenance staff in ADL. We are hearing from QantasLink we might be offered jobs with QantasLink though a labour hire company Sigma like the recently redundant Q400 permanent night shift staff at CBR. Again no mention of this in the media release? For South Australia employment of technical expertise, this outcome is sad. We in South Australia are facing the potential loss of ‘Quality’ employment (Holden/ASC/Cobham). Cobham has conducted its business in exemplary way, the work force are the finest of Aircraft maintenance Engineers in Australia and this is not how they should be treated by another Private company (masquerading as the national airline) acting so ‘UnAustralian’ in their business dealings. It may be the new world of finance to behave in such a fashion for short term financial gain; but, like so many events like these there is often HuFa consequences that were not factored in the ‘Holistic Decision’, such as the loss of ‘Quality and Safety’ to the flying public. These old B717’s were maintained to high standard as a result of the care and professional attention given by the Cobham AME’s that understood the nature of these aged aircraft. The new Qantas methodology is enshrined in their CEO’s famous statement regarding ‘New Aircraft’ are like ‘New Cars’ and don’t require as much maintenance! Well then, how will these ‘Old’ Aircraft be maintained by the streamlined Qantas aircraft maintenance workforce? without the benefit of Cobham’s dedicated workforce? Mistakes likes these by ill informed ‘Bean’ Counters affect more than just the Flying Public! I tip my hat to the Cobham AMEs and wish them well. Well I already made a comment on the related AA article about Cobham’s loss of this contract and then I read this article and the comments that followed which put the Qantas decision into a different perspective. John indicated “the supposed 40 skilled jobs set to be created are planned to be through contract hire companies and not full time positions with Qantaslink” and Snork has fairly much confirmed that. This seems to be the way of the world but in my opinion that is another short sighted approach for which the pendulum will turn again in a few years when companies realise they are left with shallow true in-house expertise and don’t even understand how to run their own business anymore. I once wasn’t a supporter of unions, but now I am. Seems to me the Cobham LAMEs in Canberra should stick together (and join their union if not already done) to make sure they don’t all get really crappy hire and fire type labour hire contracts via Sigma (or who ever) acting for QantasLink. On another subject: There have been some discussions in Federal Senate recently (as broadcast on ABC radio) about proposed new arrangements for qualifications/skills required for aircraft inspection such as those between flights. Seems there was interest in making that open to non-LAMEs. I didn’t catch it all. I worry this is the thin edge of the wedge in terms of de-skilling the workforce who look after our airliners – all for the sake of economics. Thankfully there are some senators such as Nick Xenaphon who were questioning the wisdom of such ‘initiatives’. Follow up suggestion: Better still, it would be nice if Cobham could secure some work for its Canberra workforce (such as for Virgin Australia??) such that Sigma can’t find any suitable local LAME employees to ramp up QantasLink workforce under ‘labour hire’ arrangements. Then QantasLink might have to come back to Cobham cap in hand and offer the 717 maintenance work back again! It also seems like the ACT Government must have provided some incentives for QantasLink to shift more of the maintenance work to Canberra. I wonder what conditions the ACT government had placed on the employment arrangements for the LAME’s to be taken on? Probably didn’t come into it.